My preschooler and I have been having fun doing some easy St. Patrick's Day preschool cutting crafts over the past week or two. These crafts have helped us work on scissor skills in a fun and creative way. We made a rpaper rainbow, a pot o' gold, and a heart shamrock so far. Last week my daughter said she wanted to make a Leprechaun! We got the materials prepped and then we made this silly Leprechaun with a snipped beard! I pre-cut an oval for the Leprechaun's face because my daughter wasn't wanting to cut it out. If your child is older you could totally have him cut it out. Next we glued the oval onto the face of the paper bag and then we got our orange cardstock and snipped some orange strips to make the beard! We also cut out some eyebrows from the orange paper and then we glued the beard and eyebrows on. My daughter's fingers were tired after all the beard cutting so I cut out the green hat pieces while she glued on some eyes! Next we glued on the hat and nose and we added a black and gold band around his head to finish up the project! Once the project dried then the kids could stick their hand inside the Lepechaun puppet and make him do goofy things! At our house the Leprechaun likes to leave quite a mess on St. Patrick's Day, so the kids really had fun acting like he does! 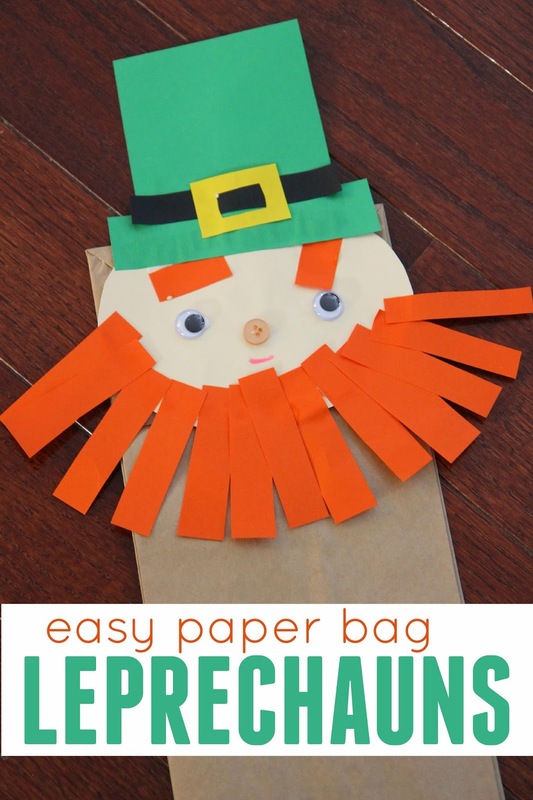 If your kids like Leprechauns here are a few other fun Leprechaun projects and activities to try! You can find lots of our other favorite St. Patrick's Day activities and crafts on our St. Patrick's Day pinterest board. My son and I did this activity at 6:30am this morning! I was prepping the activity for later in the day and my son saw the materials and wanted to get started right away! It was easy and fun to make.